An outline of the Spartan-IV augmentations. "We're not exactly like those artificial gods from the earlier generations. More like demigods. And I'll be damned if that usually isn't good enough." Project ORCHID is the codename for the SPARTAN-IV Augmentation Program, a set of biochemical and surgical augmentation procedures performed on the Spartan-IV supersoldiers. Because of practical necessities arising from the SPARTAN-IV program's return to the ORION Project's recruitment protocols—namely, the use of adults as candidates—as well as advances in technology, the fourth-generation augmentation set differs considerably from the procedures used in the SPARTAN-II and SPARTAN-III programs. While the SPARTAN-IV augmentations enhance the subjects' strength and speed, the improvements in these areas are not as extensive as in the two preceding programs and their technological underpinnings are considerably different. However, the SPARTAN-IV augmentation series also introduces many specialized procedures not applied before, and the second generation of Mjolnir armor, standard issue to all Spartan-IVs, is able to effectively bridge the physiological gap between them and the earlier generations due to its superior physical enhancement. Like the augmentation procedures of the preceding SPARTAN programs, Project ORCHID is sponsored by the Office of Naval Intelligence's Section Three. "When I say walking gods, I mean the Spartan-IIs. Like the old Greek Titans in the way that they live among us but are literally head and shoulders better in every way. And they’re just about as hard to kill. The fact we lost so many of them during the Covenant War tells you something about how horrific that conflict was. The soldiers in the SPARTAN-III program were more like your standard gods of myth and legend, the Titans' kids. Hermes and Apollo and Aphrodite and such. If the Spartan-IIs are more powerful than you can imagine, Spartan-IIIs are probably just inside your limits. The Spartan-IVs—my new designation—are like demigods then, the offspring of the real gods. Think Hercules. We can pass for regular people most of the time—something folks would generally have a hard time mistaking the earlier generations for—but inside, we're far more than that." Like their forebears, the Spartan-IVs undergo a series of chemical and surgical procedures to enhance their physical capabilities. However, few of the procedures are directly derived from either the augmentations of the Spartan-IIIs or those of the Spartan-IIs, instead employing different methodologies to the same ends. For example, the carbide ceramic ossification used for skeletal reinforcement in the SPARTAN-II and SPARTAN-III programs has been replaced by the implantation of skeletal fullerene lattices, and the subjects' eyesight is now enhanced through the use of implants rather than the previously used retinal capillary inversion. The procedures used in the two preceding SPARTAN programs necessitated that the candidates meet exceedingly strict genetic qualifications as well as the application of the enhancements on preteens to avoid the catastrophic failure rates produced by the augmentation of adult subjects in the ORION Project. The augmentation techniques used in the SPARTAN-IV program can be performed safely on adults and without stringent genetic requirements; as a result, Spartan-IVs can be recruited based on their skills and abilities, rather than their genetic qualifications. The augmentations for the SPARTAN-IV program feature a number of new procedures not used in the preceding programs. Due to the subjects' bodies no longer being in developing stages as well as their lack of genetic requirements, the process must be carefully custom-tailored for each individual. Torpet datacluster installation The subject is given a specialized neural implant—taking the form of a torpet datacluster—capable of interfacing with an artificial intelligence. The neural interface controller extends from the dataport at the base of the skull to the midbrain. Muscular/skeletal engineering series The Spartan's bones are infused with skeletal fullerene lattices, regarded as "tougher than steel", which makes them virtually unbreakable and allows survival in harder impacts. The joints are also reinforced or replaced while the bones are lengthened, making the subject several centimeters taller than they originally were. The reinforcement is necessary as without it, simple actions such as jumping would result in the bones disintegrating due to the strain from the strengthened muscles. The subject's ligaments are reconstructed during the procedures. Muscles are subjected to induced muscular growth and injected with a material that allows them to work harder without breaking the Spartan's skeleton. Subjects also undergo muscle grafting. The augmentations also give them an enhanced muscle memory, which makes observing and learning combat techniques much easier. Neurological series The nervous system is "super-myelinated" to increase the production of myelin sheaths and, therefore, the subject's reaction time. The nervous system is subject to various element treatments, including an increase in cyclic adenosine monophosphate (cAMP) responses and the rebuilding of neuroendocrine cells. Organ implantation Aside from the brain, virtually all other organs in the body are either modified in some manner or replaced. Several organs are biofabricated, including the lungs. The lungs implanted into the Spartans are biofabricated and lined with a STONEWELL pulmonary surfactant; a polymer that enhances oxygen intake and allows the subject to process airborne toxins or foreign gas mixtures. The pancreas is replaced by an apparently unnamed, vat-grown organ. The Spartans also undergo treatments to prevent organ rejection. Corneal implants are provided, improving the subject's eyesight and night vision. Circulatory and metabolic improvement Subjects undergo numerous circulatory improvements. The heart is implanted with a synthetic, polythread weave which significantly increases its capacity to pump blood. Chondrocytes are genetically altered to allow for faster clotting. Subject's blood is modified to make the Spartan immune to most toxins. Spartans are also subjected to K5.2 hemoescutcheon, and implanted with circulatory shunts and intelli-fibrin acclimation, likely aiding in the healing of wounds. Intestinal bacteria are altered to enable the digestive system to absorb more nutrients from food. An intestinal bioreactor is also implanted, and the subject is given a gut microbiota refresh. Gene therapy Spartans undergo an extensive gene therapy, which involves the lengthening of the telomeres and increasing the effectiveness of chondrocytes. Other Subjects are implanted with a handful of tiny, durable biomonitoring implants, one of which is installed near the fourth and fifth lumbar vertebrae, designed to aid medical teams remotely monitor the Spartan's health and performance. Subjects are also implanted with electronic locators to allow the United Nations Space Command to track each Spartan. Endcap augmentation The Spartan is subjected to hormone-regulation therapies and their bioprofile is archived. "The original plan was to create Spartans with no armor. They'd have unbreakable bones, and be capable of feats of strength normally possible only with armor. But even for Spartans, the cost of augmentation was too high…"
A series of additional augmentations were included in the earliest, prototypical phase of the SPARTAN-IV program. Unapproved by the UNSC Navy's committee that regulated other matters relating to the SPARTAN-IV program, this experimental phase of the augmentation program was conducted entirely by the Office of Naval Intelligence. These enhancements would have made the Spartans significantly stronger and more resistant to injury, the goal being that they could operate without Mjolnir armor. However, these procedures proved to have an unacceptably high casualty rate, killing or crippling nine of the ten initial candidates; the sole survivor, Ilsa Zane, was rendered mentally unstable and began suffering homicidal tendencies. Demonstrating the effectiveness of these experimental enhancements, Zane was able to engage a Mjolnir-armored Sarah Palmer in hand-to-hand combat without the use of any protective equipment and survived Palmer violently driving her head into a metal bulkhead face-first, as well as her subsequent prolonged exposure to the vacuum of space. Several years later, she was able to charge into a group of Orbital Drop Shock Troopers and knock them to the ground. She was noted to move with incredible speed and power. Sarah Palmer undergoing the augmentations. "I spent a period of three weeks on Mars, in and out of surgeries and other so-called advanced therapies designed to transform me from a top-flight Helljumper into something approaching the closest thing humanity had to walking gods. And it hurt in every damn way it could." The SPARTAN-IV augmentation procedures, at least for the first and second classes of the program, take three weeks to perform, with the Spartans in and out of surgeries and advanced therapies during this time. Following the augmentation procedures, recovery and subsequent training usually lasted several months. It took about two days for the first team of Spartan-IVs to relearn how to walk again following their augmentations. Significant disorientation was in evidence during their initial training exercises. The final steps of the augmentations are an assurance of hormonal regulation and the archiving of the subject's bioprofile. Largely overseen by the Office of Naval Intelligence, the augmentation procedures are conducted in a dedicated Spartan-IV facility on Mars and are considered excruciatingly painful. Approximately two dozen candidates were augmented and conditioned at any given time during the second Spartan-IV class. Certifying medical review officers are responsible for reviewing the results of the procedures on each Spartan-IV candidate; Doctor Longo Berger was one such individual. "I'm a regular 26th century girl. They swear these three weeks of surgeries will be worth it." 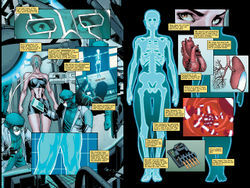 Reflecting on her augmentations, Sarah Palmer stated that the synthetic cardiac weave allows her to "outrun a horse". The enhancements performed on the lungs potentially allow a Spartan-IV to breathe methane for around an hour. Nutrition-wise, it is also said that a Spartan could eat a raw tree and retain the equivalent of six meals' worth of calories in terms of energy. According to Edward Buck, the ocular implants enable him to see in the dark and read the fine print on release forms "from across the room". The subject's hearing is also greatly improved. Thanks to their neurological enhancements, Spartan-IV's exhibit between a 10 to 20 percent improvement in their General Cognitive Propensity scores when paired with deep learning methods. The Spartan-IV's GEN2 Mjolnir armor further enhances their augmentations. However, the decision to augment adults as opposed to preteens comes at the cost of performance: the results of the Spartan-IVs' physical augmentations are not as effective as those of the preceding generations. To compensate for this shortcoming, the GEN2 Mjolnir armor worn by the Spartan-IVs is designed to multiply the wearer's strength and speed significantly more than first-generation suits. At least in theory, this makes a Spartan-IV clad in GEN2 armor equal to a GEN1-wearing Spartan-II in terms of strength and speed, but the Spartan-IV would be at a considerable disadvantage without armor. The physical disparity between a Spartan-IV and a Spartan-II has been compared to that between an elite-level athlete and a "near-supernatural monster". Spartan Edward Buck also compared the Spartan-IVs to demigods while respectively likening the Spartan-IIs and Spartan-IIIs to the Titans and gods of Greek mythology. Also, Spartan-IV augmentations lack the stability of earlier generations, meaning they need constant "tune-ups" to ensure nothing goes wrong with their bodies. While falling from the sky over Cassidy III, Buck doubted he'd survive even with his augmentations and armor despite John-117 having survived a similar fall years earlier. Buck's reasoning was that while the Spartan-II's had been literally made to be invincible, the UNSC had figured out how to cut some costs by the time it got around to him and his own augmentations didn't make him nearly as invincible. Spartan-IVs must follow a rigid set of guidelines to maintain their physical fitness and health. These include undergoing regular medical examinations, including physiological scans, reviews and treatment before and after each mission. A Spartan-IV is expected to perform at optimum capacity with a minimum of two and a half hours of sleep per 48-hour cycle; for cryosleep, standard UNSC practices apply. They are also instructed to follow standard physical training practices of the UNSC. Due to their augmented physiques, however, they are provided their own, custom-built gym equipment. Official meals are specifically prepared to meet the caloric, nutritional and medicinal needs of each individual Spartan. These personal needs are measured based on activity data recorded by the Spartan's individual physiometer. Ancillary medications may be provided to ensure the Spartan's well-being and to reduce risk of potential implant rejections. The effect the augmentations have on lifespan is unknown, though it is theorized that most Spartans can surpass the average human lifespan, and it is expected their peak fighting days will exceed a century. 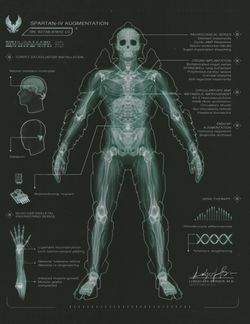 Many of the gene therapies, artificial organ implants, and cybernetic enhancements used in the SPARTAN-IV program's augmentations are irreversible. Few within the UNSC and Unified Earth Government have forecasted the impact these men and women will have when they leave military service and re-enter civilian life as augmented humans. Training performance of the initial unit of Spartan-IVs in January 2553 was mixed, something that was acknowledged by the program's head recruiter, Spartan-III Jun-A266. Part of this may be attributed to the Spartan-IVs' still-ongoing acclimatization to their enhancements, as well as the group not having worked together before, though all of them came from military backgrounds. The majority of the first batch of Spartan-IVs were incapacitated by their unaugmented Marine training opponents, who outnumbered them ten to one, and their lack of coordination resulted in SPARTAN-IV program head, Commander Musa-096, personally chastising them about the importance of teamwork. However, several Spartan-IVs of this group later distinguished themselves in live combat during the New Colonial Alliance's attempted takeover of UNSC Infinity several days later. Spartan Jameson Locke, a Spartan-IV, grappling with John-117, a Spartan-II. Later combat performance also shows marked improvement to the training sessions of the initial group. During a 2555 mission to Talitsa, Spartan Edward Buck fought Spartan defector Michael Crespo in hand-to-hand combat and shattered the faceplate of the latter's GEN2 Mjolnir armor by pummeling it repeatedly. Spartan Kojo Agu killed multiple insurrectionists of the United Rebel Front by throwing rocks at them before procuring a weapon from the fallen rebels during the same mission. Agu subsequently assaulted a nearby rebel stronghold single-handedly, eliminating numerous rebel combatants and rescuing hostages. During the Requiem Campaign, Spartan Gabriel Thorne was able to fight five Sangheili in close-quarters combat and successfully kill them before being subdued by two other Sangheili. Thorne later fought Gek 'Lhar—who had previously killed several Spartans—in hand-to-hand combat and held the upper hand for a majority of the brawl, before having a boulder smashed on his chest and unprotected head, dazing him. Later during the Requiem Campaign, Spartan Paul DeMarco was able to defeat multiple Sangheili and a Promethean Knight in close-quarters combat. During the Battle of Ealen IV, Spartan Naiya Ray defeated a Sangheili Warrior in close-quarters combat. While on a War Games simulation marathon, Sarah Palmer fought and killed a Mgalekgolo with her bare hands. During a physical confrontation between Spartan-II John-117 and Spartan-IV Jameson Locke, the latter was able to hold his own and even appeared to have the upper hand against the Spartan-II. However, John was eventually able to gain the upper hand in the melee with a headbutt and neutralized the Spartan-IV with his own armor restraint. It should be noted that both Spartans appeared to lack the intent to kill the other for this particular battle however with Locke specifically having orders to take the Master Chief alive.